Folder Size is a powerful utility that can scan and display all the file and folder sizes on your hard drives. It can scan entire storage device or a chosen folder. Note: the developers added advertisements after the program was added to the database. How to extract: Download the "Portable" ZIP package and extract to a folder of your choice. Launch FolderSize.exe or FolderSize64.exe (for 64-bit OS). I prefer TreeSize Free - it's fast, presents all the information you need and you can even filter your search results. It also scans network attached storage and network shares. Perfect solution for me. 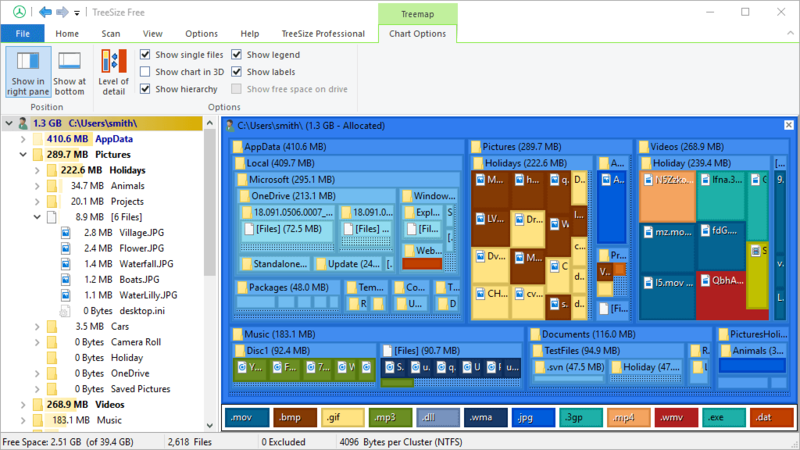 TreeSize Free shows you instantly which files or folders are taking up the most space on your harddisk without using heavy system resources or reading the drive extensively. Alternatively, TreeSize Free Portable is pre-configured to be portable, automatically adjusts paths and is stealth. Stealth: ? No. Creates an empty JAM Software\TreeSize Free folder in %AppData%. If the context menu integration is enabled/disabled, settings will be written to that folder. How to extract: Download the "Portable" ZIP package and extract to a folder of your choice. Launch TreeSizeFree.exe. Thanks for the tip, your workaround really worked! Anyway, I notified the developer about this problem. In file "GlobalOptions.xml" Search for the text "True" and replace it with "False"
Save the file and close the editor. TreeSize Free will now start without the ribbon interface. 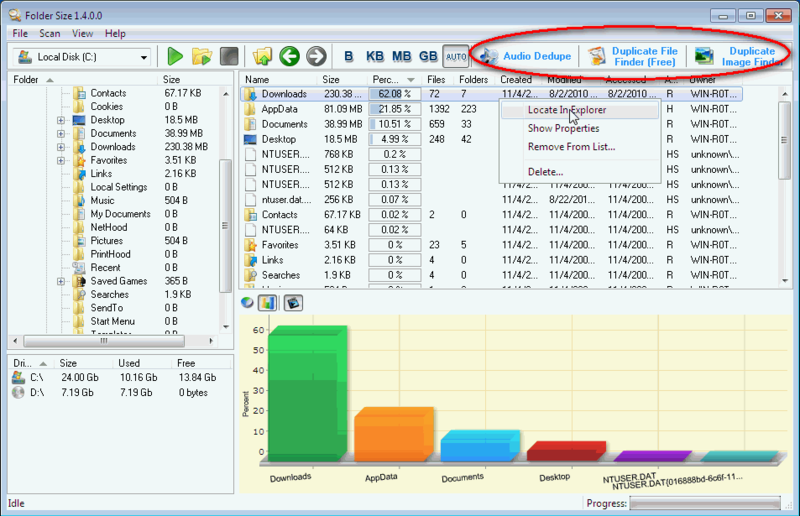 WizTree is a very fast disk space analyzer and search tool, scanning a single folder or your entire hard drive quickly and showing those files and folders using the most disk space. The program uses the NTFS Master File Table (MFT) feature in Windows to rapidly view files. Note that this high-speed mode is limited to local, NTFS-formatted drives. The program must do a (much slower) scan of FAT-formatted or network drives for analysis. How to extract: Download the "Portable" ZIP package and extract to a folder of your choice. Launch WizTree.exe or WizTree64.exe. Yeah I'm not sure what mcodex is smoking, you can like Spacesniffer more because of *reasons, that's subjective, but speed in this case is not. WizTree is damn fast. Looked promising, but wouldn't run at my workplace because, I assume, it assumes that it will be running as Admin in order to peer into the NTFS metadata. NOTE: SpaceSniffer and WinDirStat does not require Admin. 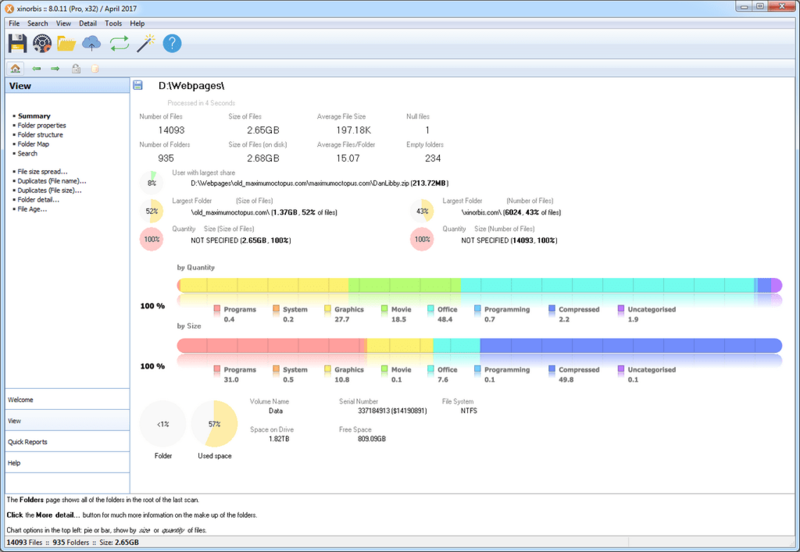 Xinorbis is a powerful data analyzer that provides an intelligent view of drive or directory contents. The program makes visible the contents, structure, file distribution, with a mix of graphs, tables and tree displays. Unlike other space usage programs that focus on just tracking down space hogs, Xinorbis helps deliver a better overall understanding of your machine's data. The program includes feature-rich report generation with a variety of export options and ability to compare how contents have changed between reports. How to extract: Download the ZIP package and extract to a folder of your choice. Launch x8.32.exe or x8.64.exe. It doesn't display some German special characters correctly (e.g. ß), and more importantly, it shows a "buy the pro version" nagscreen upon exit and opens the product homepage in the system's standard browser. Emka, you're right. Some problems with the French language too. And a very annoying nag-screen, and automatic launch of the browser. Too bad! I will try to see this with the author, but I suppose that is part of his strategy to force the sale of the Pro version, so there is only little chance to make him change his mind!